Hernando de Soto of Spain was among the greatest of the Spanish conquistadors. Cruel and ambitious, calculating and clever, he rose from the obscurity of grinding poverty to become one of the most renowned explorers in the world and has remained among the most recognized names down through the centuries. He was at the vanguard of a new class of explorers that would come to be known as the conquistadors. 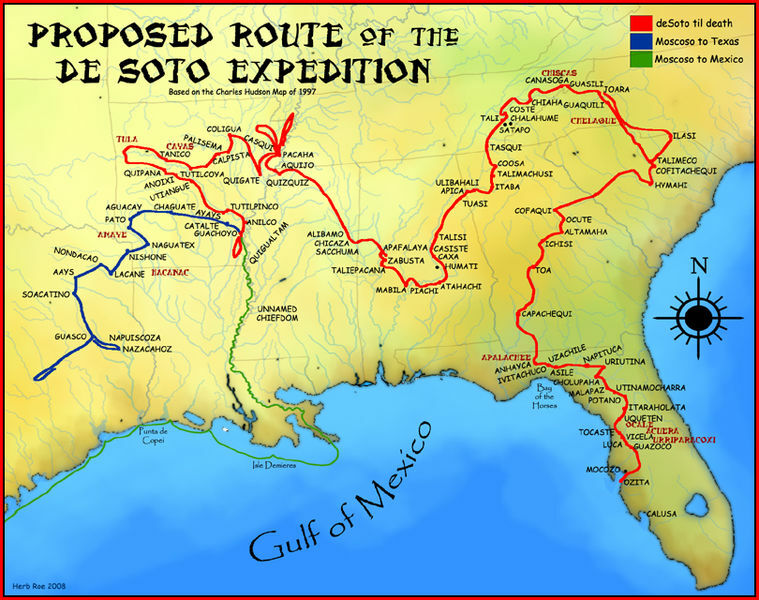 De Soto was the first European man to cross to the western side of the Mississippi River – the shores of which would prove one day to be the site of this death. Hernando de Soto was born in 1496 in a community of Spain called Extremurda, although it is unknown if the village of his birth was Badajoz or Barcarrota. Whatever the case, this was a region where just about everyone was poor and of the peasant class. The only way out of poverty for most unconnected young men like de Soto was to win glory in military service or ship out to sea. This was the era which the Spaniards had booted the Moors from the Iberian Peninsula. Fresh opportunity for military advancement and greatness was greatly diminished. Fortunately for de Soto, Christopher Columbus had shattered the dreary, stagnant culture of medieval Europe by discovering the New World in 1492, just four years before de Soto was born. By the time he was in his late teens, all of Europe was energized by the discovery of new lands in the West, promising incredible adventure, wealth, and fame. All of the above was exactly what Hernando de Soto longed for. At age 17 or 18, de Soto was fortunate to ship out in 1514 with Pedrarias Dávila, a Spanish colonial administrator who led the first truly significant expedition to the New World. On this ship, de Soto proved himself to be an extremely loyal sailor, showed natural leadership ability and was obviously intelligent as well as eager for the success of the mission. His efforts quickly earned him a leadership role. Dávila eventually made him regidor of a colony in what is today Nicaragua. De Soto found himself now a man of some substance, owning an estate in the New World. However, such a man as de Soto was not the kind to settle down and be content in a position of relative wealth. His ambitions led him to form and lead an expedition into the Yucatan in a search for a passage to the Pacific Ocean, which he hoped would lead to an easy route to China, where fabulous wealth was to be had in trade. This expedition failed, and so de Soto left his estates, purchased ships and joined the forces of Francisco Pizarro, the man who would soon conquer the Inca Empire. Again, de Soto played a key role in this major event. He was among the captains who led the forces which devastated the Inca warriors. In fact, de Soto was the man to lead a small force of 15 men who were the first to make contact with the supreme leader of the Inca, the great Atahualpa. De Soto actually became friendly with the Inca ruler, even teaching him to play chess. But it was all part of a larger plan of deception and treachery. While de Soto gained the confidence of the Inca hierarchy, Pizarro was busy formulating his plans to conquer this ancient empire. Pizarro and de Soto had only one goal in mind – to kill as many Inca as possible, destroy their empire, take their gold, and enslave whoever survived the conquest. The Spaniards made short work of the Inca. The massive plunder of gold, silver and other precious objects made de Soto fabulously wealthy. He stayed on for a time in South America, in what would be modern-day Peru. He served for a time as lieutenant governor of the major Inca city of Cuzco while his boss, Pizarro, began the building of his own new capital city, which would one day become Lima, Peru. But great wealth and power were never enough for the restless de Soto. He was a man who enjoyed war. Indeed, de Soto was well known for his cruelty and brutality. He relished in the slaughtering of native South Americans who, in general, were no match for the superior weaponry and firepower wielded by the conquistadors. So de Soto made a bid to join the continued conquest of the South American continent. He offered a large amount of money to be second-in-command to Diego de Almagro, who was Pizarro’s business partner. Almagro planned to move south into Chile to wipe out the southern half of the Inca Empire. For various reasons, de Almagro wanted nothing to do with de Soto – so de Soto packed up, loading his enormous wealth onto a ship and went back to Spain. De Soto left Spain a lowly peasant, but returned as one of the richest men in Europe. He also quickly gained enormous power by becoming associated intimately within the circles of Spanish monarchy, which then was ruled by King Charles. De Soto was admitted into the prestigious Order of Santiago. He was also granted governorship of Cuba. At this point, de Soto could certainly have retired and lived out the rest of his life in wealth and luxury, such as it existed in early 1500s Spain. But true to form, de Soto, the restless, brutal conqueror, soon set out to take his rule of Cuba, but with the further mission of establishing Spanish influence into the southern mainland of the North American continent. He put together a extremely well-armed and well-supplied fleet of nine ships manned with a total of 620 men, and set sail once again for the West. 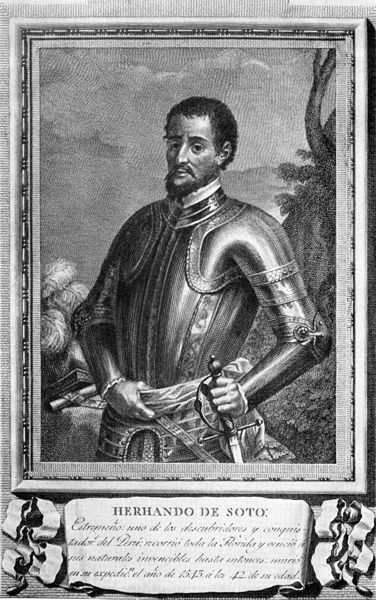 Hernando de Soto eventually landed in Florida in 1539. He then began an extensive trek of exploration across a broad swath of what today is the southeastern portion of the United States. His travels took him through present-day Georgia, the Carolinas, Tennessee, Arkansas, Oklahoma, Louisiana, Texas, and Mississippi. The whole way de Soto was looking for two things: Gold and passage to the Pacific Ocean. 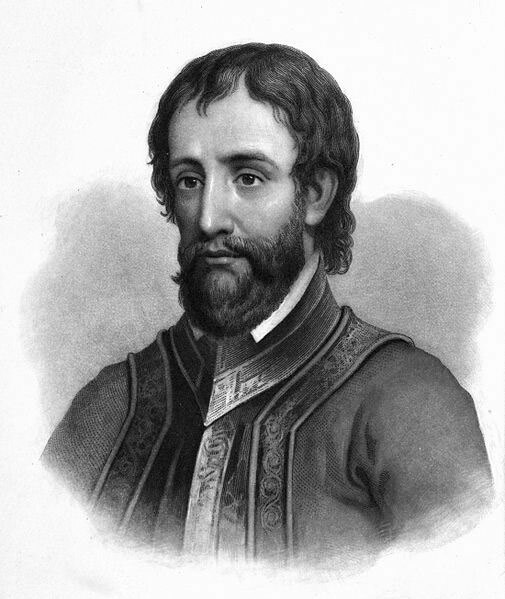 After three grueling years traveling through the incredible wilds of the American southeast, fighting clashes with natives, mapping territories, searching for wealth, and losing half of all his men – de Soto contracted a form of semi-tropical fever and died in 1542 on the western banks of the Mississippi River, possibly in present day Louisiana or Arkansas. He was 46 years old. Certainly no one to be proud of. God bless his soul. When de Soto died he placed Luis de Moscoso Alvarado in command of the expatiation. I’m searching for more information on Alvarado. Any help would be appreciated.